ehsInc is helping change lives one student at a time. One AGC-CA CEF student member in particular, Linda Tran, recently received a scholarship we helped sponsor. We are truly honored to have been able to contribute to the Associated General Contractor's of California Construction Education Foundation scholarships. Here is an excerpt of what Ms. Tran had to say about receiving the scholarship. 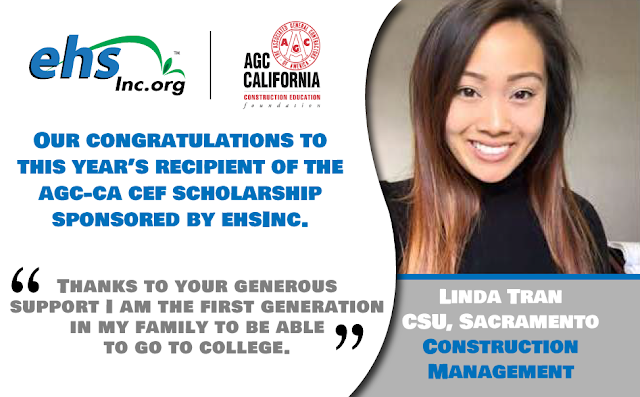 I am honored to be one of the recipients of the AGC-CA CEF Scholarship sponsored by ehsInc. Thanks to your generous support I am the first generation in my family to be able to go to college. Growing up in a less privileged community has not only offered financial and academic challenges, but has also helped me realize the value of a higher education.